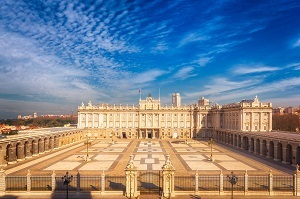 One of the top tourist attractions in the city of Madrid, the Royal Palace is the official residence of the royal family. However, it is only currently used for state ceremonies and it is open to the public for the rest of the time. Also known as the Palacio Royal, it was built during the 18th and 19th centuries and is one of the most monumental buildings in the city. It replaced the former medieval Alcazar which was burnt to the ground in 1974. The Royal Palace in Madrid was decorated according to the taste of Charles III and this is very apparent in the lavish interiors. In proximity to a number of good hotels, the palace was built on what was once a 9th century fortress. Carlos I has a permanent residence on the site that was burned down in 1734. Felipe V commissioned the palace that stands today on the site. The palace has a whopping 3,418 rooms and just under 1.5 million square feet of floor space, making it Europe's largest based on floor area. 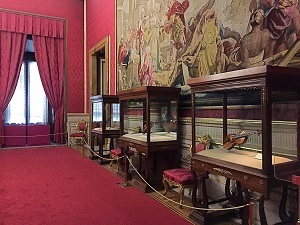 The interior of the Royal Palace has priceless arts, watches, frescoes, porcelain and several treasures including the only complete Stradivarius string quintet in the world. The palace's main staircase has more than 70 steps. 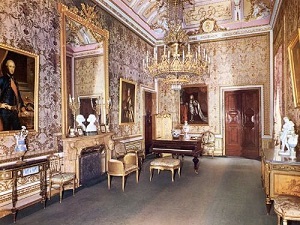 Several of the rooms in the palace are open to the public, which are full of furniture and ornate architecture which feature the history of the Spanish people. 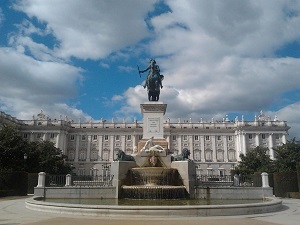 Madrid is a beautiful city that is a must-see destination with several tourist attractions, the Royal Palace included. Fortunately, there are plenty of options for people who would like to explore the city, including Madrid day trips, and Madrid walking tours. Travelers on a tight budget will be happy to know that there are plenty of free things to do in Madrid. Just seeing the exteriors of the Royal Palace is already impressive enough but there is also so much to see inside that it is an opportunity that you should not miss. The elegant iron fencing conceals a vast courtyard, and to the side of the courtyard is a stunning view of the countryside beyond. Come on a clear day and you will see a breathtakingly panoramic view. The Royal Palace housed the kings and queens of Spain from the mid 1700s to the 1900s. Although it is no longer the residence of the Royal Family now, it is still considered as so. You can expect to be wowed by the luxuriousness and the grandeur of the palace. However, the long lines is something which people constantly complain about. So, the best thing you can do is go there early, or better yet, get skip-the-line tickets. Once you are inside the Royal Palace, you have the option of purchasing either a ticket for a guided tour, or a regular ticket which allows you to walk at your own pace. The guided tour is ideal for those who would like an in-depth lesson about the palace which takes almost an hour. If you decide to get the regular ticket, there are information points throughout which explain more about the rooms and their different functions. Getting a regular ticket gives you access to lavish halls, residential areas, the throne room, banquet rooms, the Royal Armoury, and the Royal Pharmacy. Several significant events have taken place in the palace including the signing of the treaty of Spain which granted them acceptance into the European Union in 1985. There are also art exhibits which are available for viewing at no extra charge. The Royal Palace is open in October to March, from 10 am until 6pm and in April to September, from 10 am to 8 pm. It will be closed in January 1, January 6, May 1, October 12, December 24, December 25 and December 31. 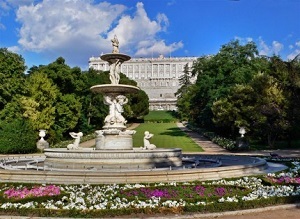 The Royal Palace in Madrid is a 5-minute walk from the Opera metro station. From the Airport, take Line 8 to Nuevos Ministerios and then change to line 10 and get off Plaza de Espana station. You will see the Royal Palace after 5 minutes. Alternatively, people coming from the centre, around the Plaza Mayor, can follow Calle Mayor directly to the palace and you they will find themselves at its doors in less than fifteen minutes. Filippo Juvarra was the architect who took inspiration from Gian Lorenzo Bernini, as well as French Baroque palaces. He died in 1736 and architect Giambattista Sacchetti took the over the reins of the design process. Francesco Sabatini was summoned to expand the building in 1760. Built by Sabatini in 1789 and moved from where it was originally place in 1760. It is composed of a single San Agustin marble. Moved to the lower floor during the reign of Maria Christina with bookshelves dating to the period of Charles III. Considered as one of the best in the world, next to the Imperial Armoury of Vienna. It consists of pieces from the early 13th century. The building was designed by E. Repulles and J.S. de Lema and was opened to the public in 1897. Being on the top landing gives a sweeping view of the ground floor Check the book covers which demonstrate the evolution of binding styles through various eras. Some great examples are the Rococo in gold with iron lace, as well as the Renaissance and Gothic motifs. Look out for the shield and burgonet made by Francesco and Filippo Negrolli, one of the most famous designers in the armourer's guild during that time. Watch out for and take a photo of the two lions gracing the landing, as well as the ceiling frescoes depicting Religion Protected by Spain made by Corrado Guiaquinto. Be on the lookout for library highlights such as the Book of Hours of Isabella of Castile, a codex of the time of Alfonso XI of Castile and a bible of Doṅa Maria de Molina and a selection of medals from the Royal Collection. Check the highlights of the royal collection which include pieces made for Charles V and Philip II by the leading armourers of Augusburg and Milan. 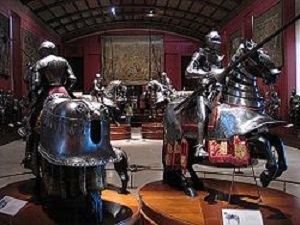 Some of the most remarkable works are full armours and weapons that Emperor Charles V used in the Battle of Muhlberg. 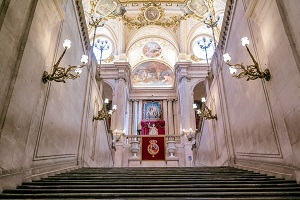 A staircase that lives up to its name, the Grand Staircase at Palacio Real is made of San Agustin marble. One of the most beautiful in the world, it has more than 70 steps and has ceilings with frescoes portraying “Religion protected by Spain.” The Grand Staircase was built by Sabatini in 1789 and the Sabatini Gardens behind the palace was named after it. On the ground floor is the statue of Charles III wearing a Roman toga. On the landing are two lions made by two different sculptors, Robert Michel and Felipe de Castro. The Royal Library was moved to the lower floor during the reign of Maria Christina. 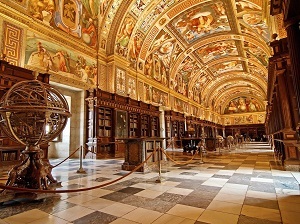 Some of the bookshelves date as far back as the period of Charles III, Isabel II, and Alfonso XII. Some of the highlights of the library collection are Book of Hours of Isabella I of Castile, a bible of Doṅa Maria de Molina, and a codex belonging to the time of Alfonso XI of Castile. The armory in Spain is considered as one of the best in the world during that time, after the Imperial Armory of Vienna. It consists of pieces as early as the 13th century and among its most remarkable pieces are the full tools that Emperor Charles V used in the Battle of Muhlberg, that has also been portrayed by Titian in the renowned equestrian portrait of the Museo del Prado. Also known as the Conversation Room, the apartment has various important frescoes and sis spread over various sections. Formerly the queen's apartments during the reign of Charles III, the apartment has three different rooms which were converted into a banquet hall by Alfonso XII in 1879. These rooms were formerly occupied by Infante Luis, the Count of Chinchon before he was exiled. Once the main chapel of the royal family, it is now used only occasionally, most notably for funerals. The funerals for both the Count and Countess of Barcelona were held in the chapel in 1993 and 2000 respectively. Formerly used by Maria Christina of Austria, the mother of Alfonso XIII. 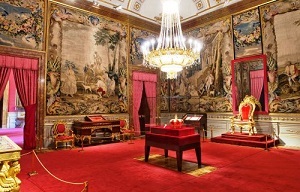 It was established following the accession King Felipe VI in 2014 to display the symbols of constitutional monarchy. See the Throne Room, Hall of Columns, and Guard Room. Some of the magnificent works or art made by Alejandro Gonzalez, Francisco Bayeu y Subias, and Raphael Mengs. The ceiling frescoe by A.G. Velasquez is something to behold, as well as the Musical Instruments Room. The reliquary altar has Ercole Ferrata's 1659 silver relief called Pope Leo I Stopping Attila at the Gates of Rome. Look out for the original throne of King Carlos III, as well as his crown and sceptre. There is also the collar of the Order of the Golden Fleece belonging to Queen Isabella II, and the Tale of Sphinxes. 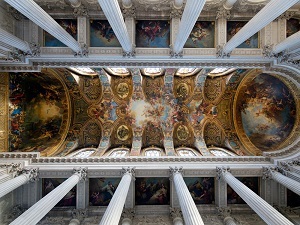 Check out the ceiling frescoes done made by A.R. Mengs. Look out for the three ceiling frescoes Do not forget to find the Stradivarius Room with two violins made by Stradivari, a viola and two violincellos. Check out the frescoes made by Giaquinto including The Holy Trinity Crowning the Virgin. One of the highlights is the majestic Empire style desk acquired by King Carlos IV in 1803 where King Carlos signed the Organic Act, confirming his abdication from the throne. 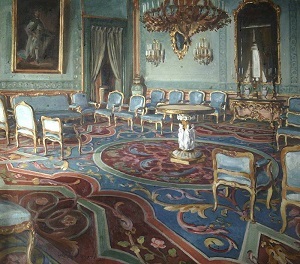 The Antechamber of Charles III is also known as the Conversation Room. It contains a 1774 ceiling frescoe called Apotheosis of Trajan by A.R. Mengs, as well as four royal family portraits made by Goya. Formerly the apartments of the queen during Charles III, the three rooms were converted into a banquet hall in 1879 by Alfonso XII. Work was completed in 1885 and the three ceiling frescoes were kept intact. Named such because they were once occupied by Infante Luis, the Count of Chinchon before he was exiled, it is now known as the Stradivarian room because it contains a viola, two violincello and two violins made by Stradivarius. The ceiling frescoe is by A.G. Velasquez. The Hall of Columns is known for its frescoe representing The Sun before Which All the Forces of Nature Awaken and Rejoice, made by Giaquinto. There is also an 1878 statue of Charles V Vanquishing Fury by Ferdinand Barbedienne. The bronze chandeliers were made in 1846 in Paris and installed under the instructions of Isabella II for her balls. This is the largest and is often considered as the most spectacular room in the palace due to the superb mirrors and rich furnishings used to decorate it. It has warmth and ease and has a decoration which has been kept intact since the reign of King Charles III. The square was laid out in 1892, according to the plan made by architect Enrique Maria Repulles. A rectangular park that connects the eastern side of Palacio Real to the Teatro Real. The plaza's eastern side is curved and is bordered by several cafes in the adjoining buildings. The gardens are named after the Muslim leader Ali Ben Yusuf, who was thought to camp in the gardens with his troops in 1109 during a siege. The Sabatini Gardens is located on the north side of the palace and extends to the Calle de Bailen and the cuesta de San Vicente. Get amazing views of the Palace from the plaza. From Plaza de Oriente, you will get amazing views of the Central Gardens, the Lepanto Gardens, and the Cabo Noval Gardens. The park is designed in the romanticist style and has several fountains. The garden has a symmetrical French design and feature a large rectangular pond surrounded by four fountains and statues of Spanish kings. The Almudena Cathedral faces the palace from across the plaza and it has a neoclassical exterior to match the surroundings while the interior is neo-gothic in design. The annual flowers are something to behold, and the magnolias, yew, and small cypress consist some of the seven flower beds. Take a beautiful photo by the fountains and the Large Cavern Grotto built by Juan de Villanueva. Explore the gardens that was only opened to the public in 1978 under King Juan Carlos. The square was laid out in 1892 according to a plan by architect Enrique Maria Repulles, but its history dates back to 1553, when King Philip II ordered a building to house the royal stables. Narciso Pascual Coloer, the same architect who designed the Plaza de Oriente also designed the layout of the plaza in 1879. However, it was not realized. The site now occupied by the plaza was once used as anteplaza de armas. Located just outside the palace, Plaza de Oriente is a gorgeous rectangular park with an equestrian statue of Philips IV. The pathways divide the plaza into three sections; namely, the Central Gardens, the Cabo Noval Gardens, and the Lepanto Gardens. The Sabatini Gardens is in the neoclassical style and it follows the symmetrical French design. Work on the gardens began in 1933 under the Republican government. 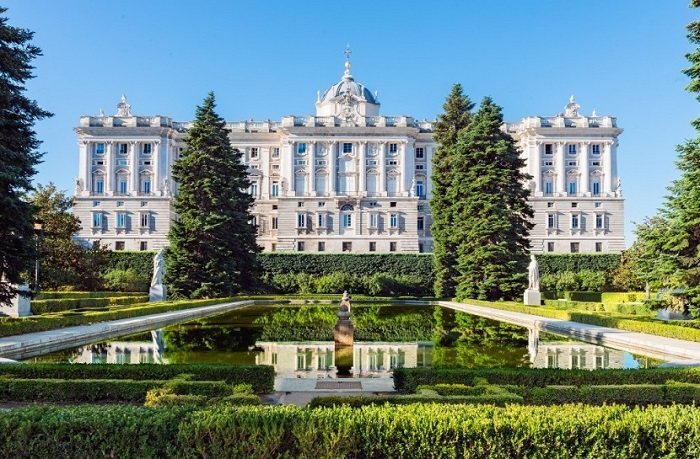 One of the garden's outstanding features is the large rectangular pond surrounded by four fountains and statues of Spanish kings, which were originally supposed to crown the Royal Palace. Also known as the Palace Gardens, the Campo del Moro Gardens started sometime in the reign of King Philip II. The gardens got their name from the Muslim leader Ali Ben Yusuf who allegedly camped there with his troops in 1109 when they attempted to conquer Madrid. The Royal Palace houses an astounding collection of classical Spanish art from personalities as notable as Goya and Velazquez. If you are an art or history buff, it is one place where you definitely have to go. Much of the palace area is open to the public, including the Throne Room, Hall of Mirrors, and the Royal Dining Hall. Always book your tickets in advance. Doing so will help you avoid long queues, thereby saving you precious time to do other things in Madrid because although the palace is truly magnificent, it is only a small portion of what Madrid has to offer. Check other Madrid city tours tickets which you might be interested in. Are the Skip-the-line tickets worth it? The answer is a big YES! Although more expensive than a regular ticket, it is worth every penny. Why put up with long queues, standing for hours in the heat when you can get instant access to one of the most magnificent palaces in the world? An extra few euros is money well spent if you can get through the doors instantly. May and October are the ideal months to explore Madrid because in May the summer's intense heat is yet to arrive and in October, autumn is in full swing so the city has already began to cool down. If you want to visit during summertime, plan your sightseeing early in the day to avoid the intense heat. Do consider that locals also take their siesta by 3pm and wait until about 7pm before resuming business. Guided tours are suitable for people who would like to have an in-depth knowledge of the palace's history and various sections. With an expert guide, you will get all the information you need and you won't be bored while exploring this splendid structure. Dress appropriately according to the weather and do not forget to bring a bottle of water with you. Exploring the palace's many halls and rooms is exciting but it can also leave you thirsty. Note that flash photography is prohibited inside the palace so best to turn your flash settings off. The palace is open 7 days a week from 10am to 8pm but close early at 6pm in the winter months. Bear in mind that the palace is closed for official state functions so check online or call ahead to avoid disappointment. Entry is free on the 18th of May which is the International Museum Day and for EU and Latin America residents during certain hours. €5 concessions, including people who are over the age of 65 years old and children between the age of 5 and 16 years old. Free entry is available for children who are younger than 5 years old, visitors with disabilities, and qualified teachers. There are also guided tours in various languages, lasting for a couple of hours. Traveling, especially with a limited budget can be a challenge, especially because there are various tours and combos available in the market. Looking through all of them requires time and effort but you need not worry anymore. We have done the hard work and checked everything that is being offered and we have picked a selected few which will give you value for your money. Explore one of the world's most beautiful palaces in this guided tour which gives you in-depth information of its history and the royals who have occupied its many rooms and satisfy yourself with tapas in one of the local bars after. Learn the history of the Spanish monarchy with a skip-the-line ticket to the Royal Palace of Madrid. Marvel at objects from the royal collections, including paintings by Velazquexz and Goya. Start with a tour of the Royal Palace and be wowed with all its opulence. Learn valuable and entertaining information from your guide as you explore the different halls and rooms. After the tour of the Royal Palace, taste several tapas at a Spanish bar and finish the tour at the historic city center to Retiro Park. The Royal Palace in Madrid is something that must be seen in order to be believed. This tour gives you an all-access visit with a professional guide so you do not miss anything about this magnificent place. This combo tour gives you the chance to explore the Royal Palace in Madrid early so that you can have the place all to yourself and also get a taste of the local wines and delicacies when visiting local markets. 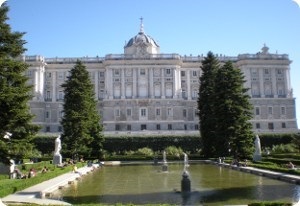 This combo tour gives you the chance to explore the Royal Palace and the Prado Museum in Madrid. You get to explore the many rooms and secrets of the palace, as well as the priceless works of art in the Prado Museum. This tour gives you skip-the-line access to one of the world's most beautiful and most opulent royal homes. Take a peek inside the rooms, uncover its gems and get some idea of its history and cultural significance to the people of Spain. This tour's goal is to show you the various views of Madrid from on-board an air-conditioned coach. You can explore the elegant squares of Oriente and Espana, as well as famous parks such as Parque del Oeste and Retiro Park, as well as the enchanting bridges across the Manzanares. Madrid's Royal Palace is something that has to be seen to be believed. This tour will give you a detailed access to the royal home with an experienced professional guide, so that you do not miss any single detail about this amazing structure. Hop on the bus and get a taste of the world famous Spanish tapas. Immerse yourself in the city's history as you explore its most famous sites such as the Royal Palace. This 4-hours excursion will help you get behind the city's architectural history, following its Moorish evolution into the Bourbon and Habsburg periods until the modern metropolis that it is now. Madrid is a city which needs to be explored and the Royal Palace is a historic monument and residence which must be seen and explored at least once. Put Madrid on your bucket list and you will never regret it. There is so much to see and explore and love about this spectacular city.